Beautiful villa set on the prestigious Secret Valley golf resort. Stunning sea views. Free use of reliable car included. 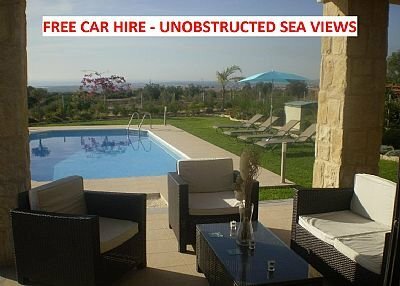 Fifteen minutes drive to Paphos harbour and town centre. Hi, my name is Nick and I’m here to walk you through this perfect villa. If you are just considering a holiday in Cyprus, you may want to hire a hotel room. But if you are looking for holiday accommodation with a certain level of sophistication, then please join me as I walk you through “villa Kallithea”. Kallithea is the Greek word for an immaculate view. This villa boasts the most glorious unobstructed views over the dramatic coastline of Paphos. The setting for the villa is on the prestigious Secret Valley golf resort. Surrounded by mountains and valleys, the glorious scenery is complemented by acres of unspoilt natural beauty and miles of virgin beach. But do not despair… you are not in the middle of nowhere. Secret Valley is conveniently located just off the main motorway that accesses both Paphos and Limassol. The Paphos international airport is an easy 12 minute drive and it’s a scenic 15 minute drive to the picturesque Paphos harbor and town centre. In the more direct vicinity you will find the quaint traditional village of Kouklia (5 min drive west), here you will find true Cypriot hospitality. A meze at the local tavern is a must for all food lovers. The village is small but has the necessary amenities and facilities. The world renowned five star Aphrodite Hills golf resort (5 min drive east) can provide you with an additional 18 hole championship golf course, gourmet dinners or a pampering day at the spa. A short drive further and you will find yourself at the legendary birthplace of the goddess Aphrodite. It is so beautiful the legend insists that the goddess of beauty herself was born from the foam of the breaking waves of the sea. The villa is ideal for golf lovers, romantic getaways, families or the young at heart. The unusual shape of the villa gives it its character. It is not a square box. The solid wood front entrance door opens into the main living area. This living room(fully air-conditioned) is bright with sunshine flowing in through a wall of glass patio doors that lead out onto the main outdoor patio The room is decorated with a modern Italian lounge suite, fine artwork, coffee and side tables. It has a LCD TV, DVD and satellite TV. The kitchen area is practical and is a cook’s dream. It has all modern appliances including fridge/freezer, oven, hob, filter coffee machine, waffle maker, blender, popcorn maker, griller and a variety of high quality designer pots and pans to make your cooking experience an event. You are on holiday…enjoy it. For a simple cleanup, simply use the dishwasher and washing machine. The dinning room is open plan and very spacious (fully air-conditioned). It comfortably seats 6 adults around the modern dinning table. Enjoy views over the swimming pool through the triple glass patio doors. There is a WC for your use on the ground floor. The master bedroom is large, it boasts a double bed fixed around an Italian bedroom suite. The side tables with their ambient night lamps warm the room. The room is of course en-suite with a bath and shower overhanging, WC vanity unit and basin. The bedroom has large glass patio doors leading to a private patio. For all the true romantics out there, the master bedroom’s veranda is perfect. Here you can enjoy a nice glass of wine and loose yourself with a picture perfect view of the sea, mountains and coastline of Paphos. The word PERFECT is the only way to descried this view! The third bedroom is a twin room. Two single beds with its side tables and en’suite shower, wc and basin. The great thing about Cyprus it the fact that the weather is so predictable, and although the villa is all the luxury comforts you want, you will probably be spending much of the day outside. The outdoor facilities will make your holiday extra special. The main outdoor patio is perfect for entertaining. It is exceptionally large and has a lovely outdoor dining area. It is covered and leads down to the swimming pool area. The swimming pool is lovely 8M X 4M in size. 4 full size sun patio beds allow you to completely relax as your body absorbs the sunshine. Use one of the cooler boxes to keep your refreshments ice cold by your side. Should you want to stay outdoors for the day, try cooking up a storm with the barbeque area and the souvla (Greek BBQ to slowly cook meat on large skewers). The green grass and landscaped gardens complete the outdoor entertainment area. My aim is to provide my tenants with above average quality accommodation that is meticulously clean. Your privacy will always be respected. It’s the little things that make a holiday extra special. The attention to detail in and outside of the villa will give you a good start to a great holiday. Don’t forget, it will be up to you to get out and enjoy Cyprus’ many attractions. Whether you enjoy a cultural day out, a day at the beach, a night on the town or just a relaxing quiet walk along the beach its what you do that will make your holiday unforgettable. The Area, Golf and facilities close by. The Secret Valley Golf Course is a highly prestigious golf course located in the renowned area of "Petra tou Romiou", the legendary birthplace of Aphrodite, the Goddess of love. It is set in a scenic valley surrounded by mature trees and beautiful natural rock formations. The course is consistently appearing as the preferred course amongst the islands visiting players in terms of sheer playability and enjoyment. The spacious clubhouse with its restaurant and bar facilities is an excellent spot to relax after a good game of golf. The interior of wood and stone is a pleasant surprise, the comfortable chairs are very inviting and you don’t want to get out of them easily ones you are seated. Very comfortable! Open daily from 07.00 – 19.00 with its ala carte menu. Sundays offer a Carvery lunch buffet. Aphrodite Hills 18-hole standard championship golf course follows the scenic contours of the two plateaux that are divided by a central ravine. A premier Golf Academy and Pro Shop enhance your golf experience, while the Clubhouse offers delectable specialties and a breathtaking view to the golf course. Pithari Tavern offers guests the opportunity to taste authentic island cookery and serves traditional tavern-type food in either the meze or the a la carte variation. The menu consists of a variety of Greek and Cypriot meat and fish dishes prepared in accordance with authentic recipes. Anoi Pub & Bar serves a large variety of draft and bottled beers, a new world wine list and quality fast-food favourites from steaks and potato skins to fajitas and spicy chicken wings, potato skins, mozzarella dips and spicy chicken wings, quickly prepared steaks, ribs and some traditional Mexican food like fajitas and the traditional juicy hamburgers. Desserts, ice creams and smoothies are also available. Zimi Pizza & Pasta is a traditional over the counter restaurant with a great variety of freshly made pizzas and calzones, oven-baked pasta dishes and pasta classics prepared to order, and a fresh salad bar for quick service. Platia Coffee Shop-Ouzerie is a truly traditional Cypriot Coffee Shop serving coffee made in the utzaki and served with with lizos—the traditional Paphos delights. The coffee shop also serves traditional Middle Eastern and preserved sweets, a variety of olive and cheese pies (Cyprus and Greek style), and other local puff pastry specialties. Gefsis Gelateria & Crêperie serves top quality Häagen Dazs ice cream, served in homemade cones of different flavours, either for seated consumption or to be sealed and taken away. Confectionary creations are also prepared along with ice cream serving such as pancakes, belgian crêpes and waffles, complete with a variety of tantalising toppings. A visit to The Retreat Spa at Aphrodite Hills is the ultimate in top-to-toe pampering for body and mind. It offers a cool serenity with monastic interior and tranquil surroundings, where superb facilities and an expert team of therapists tend to your every need. The very name Cyprus, it has been said, shimmers with an ages-old mystique. Today, history and hedonism are comfortably intertwined on the island. Ravishing five-star resorts within walking distance of well-preserved Greek and Roman ruins offer every amenity the modern traveller has come to expect and more to state of the art thalassotherapy health spas. Venture away from the sybaritic shore - if you can bring yourself to - and succumb to the slow, seductive rhythms of the interior. There are old wine-producing villages with atmospheric winding streets and terraced vineyards. Explore Greek Orthodox churches nestled in the hills whose walls conceal vibrantly painted Byzantine frescoes. Along the route that leads from Secret Valley to Limassol, the roadway opens up to reveal a magnificent stretch of coastline where chalky white cliffs stand watch over a dazzling aquamarine sea. Here sun worshippers make detours for a picnic and a swim at Petra tou Romiou, a boulder that marks the spot where Aphrodite emerged from the sea foam in ancient times. In the Akamas region, hikers exploring the areas rich flora can cool off at the grotto where the love goddess bathed after her amorous interludes. Throughout Cyprus, the typically Mediterranean landscape is still blessed with the timeless beauty of antiquity. There are crusader fortresses framed by tall cypress trees, Greco-Roman theatres carved out of cliffs and Byzantine monasteries perched improbably on mountaintops. Sophisticated cities successfully balance the ancient and modern. Archaeologists report that the site of Paphos has been inhabited since the Neolithic period. It was a centre of the cult of Aphrodite and of pre-Hellenic fertility deities. Aphrodites legendary birthplace was on this island, where her temple was erected by the Myceneans in the twelfth century BC. The remains of villas, palaces, theatres, fortresses and tombs of the Classical, Hellenistic and Roman periods mean that the site is of exceptional architectural and historic value. The mosaics of Nea Paphos are among the most beautiful in the world. After landing at Salamis and proclaiming The Word of God in the synagogues (Acts 13:5), they traveled along the entire southern coast of the island of Cyprus until they reached Paphos (Acts 13:6). There, Sergius Paulus, the Roman proconsul, was converted after Paul rebuked the evil Sorcerer Elymas (Acts 13:6-12). It was at that point that Paul effectively became the leader. He was from then on called Paul, rather than his former name, Saul. New Paphos (Nea Paphos), the currently inhabited town, was founded on the sea, near the western end of the island, and possessed a good harbour. It lay about 15 km northwest of the old city and Secret Valley. The port of Kato PaphosToday Paphos, with a population of about 47.300, is a popular sea and a fast developing tourist resort, home to an attractive fishing harbour. It is divided into two major quarters: Ktima, on the sea terrace, is the main residential district, and Kato Pafos, by the sea, is built around the mediaeval port and contains most of the luxury hotels and the entertainment infrastructure of the city. The harbours of Paphos are not so important: the normal shipping goes via the harbour of Limassol. Just as is the marina of Paphos for fishing and other kinds of interest. The Castle of PaphosAt the harbour, there is the Castle of Paphos, originally built as a Byzantine fort to protect the harbour and rebuilt by the Lusignans in the thirteenth century, then dismantled in 1570 by the Venetians, who found themselves unable to defend it against the Ottomans, who in their turn restored and strengthened it after they captured the island. Saranta Kolones, Kato Paphos, near the harbour, is a castle built in the first years of the rule of the Lusignans (beginning of the twelfth century) maybe on the site of a previous Byzantine Castle. It was destroyed in the earthquake of 1222. The legacy from its remarkable history adds up to nothing less than an open museum, so much so that UNESCO simply added the whole town to its World Cultural Heritage List. Among the treasures unearthed, are the remarkable mosaics in the Houses of Dionysos, Theseus and Aion, beautifully preserved after 16 centuries under the soil. Then there are the mysterious vaults and caves, the Tombs of the Kings, the Pillar to which Saint Paul was allegedly tied and whipped, the ancient Odeon Theatre and other places of interest including the Byzantine Museum and the District Archaeological Museum, with its attractive collection of Cypriot antiquities from the Paphos area, dating from the Neolithic Age to 1700 AD. Near Odeon, there are the remains of the ancient city walls, the Roman Agora and a building dedicated to Asklepeos, god of medicine. The mosaic floors of these elite villas dating from the third to the fifth century are among the finest in the Eastern Mediterranean. They mainly depict scenes from Greek mythology. The city contains many catacomb sites dating back to the early Christian period. The most famous is Saint Solomoni Church, originally a Christian catacomb retaining some of its twelfth century frescoes. A sacred tree at the entrance is believed to cure the ailments of those who hang a personal offering on its branches. Near Petra tou Romiou, there is Palaepaphos, Old Paphos, one of the most celebrated places of pilgrimage of the ancient Greek world, and once an ancient city kingdom of Cyprus. Here are the ruins of the famous Temple of Aphrodite, the most ancient remains, go back to the 12th century BC. The temple was one of the most important places of cult and pilgrimage of the ancient world, till the 3rd-4th century A.D. The Museum, housed in the Lusignan Manor, is small but impressive with many finds from the area. Ayia Paraskevi church in YeroskipouYeroskipou with its remarkable five-domed Byzantine church of Ayia Paraskevi, and its Folk Art Museum is a town in Paphos metropolitan area known for many years now for its special delight `loukoumi. North-east of Paphos lies Ayios Neophytos Monastery, famous for its `Encleistra, Enclosure, carved out of the mountain by the hermit himself, which boasts some of the finest Byzantine frescoes of the 12th and 15th centuries. Near by too is the painted village church of Emba (Empa). Four kilometres north of Paphos is the village of Lemba (Lempa), which has become home to numerous artists, many of whom have open studio shops, the sculpture known as the Great Wall of Lempa, by the Cypriot artist Stass Paraskos and the Cyprus College of Art.